Pure as a diamond and as fiery as passion, this bouquet speaks volumes about the power of your love. 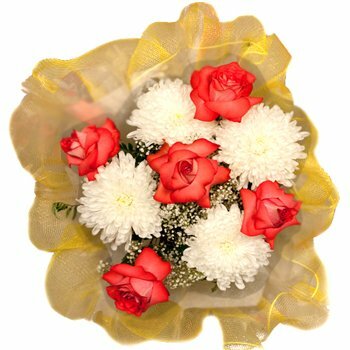 You'll sweep her off her feet when you present her with this eye-catching collection of dazzling white mums surrounding flaming red roses in full bloom. On anniversaries, birthdays, or any romantic occasion show your feelings with the Diamonds and Fire Bouquet.